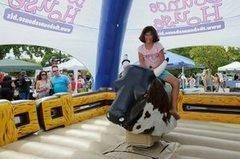 Mechanical Bull Rental Atlanta and surrounding area, including all the Souteastern US. Our new Deluxe Bull offers all of the fun and safety features as our Standard Bull, but includes an upgraded Barn Yard themed inflatable, and the bull blows smoke!! $850.00 for the first two hours. $200 for eah additional hour. Includes operator.